I’ve been talking with friends about the ways they bring beauty into their everyday lives and have been moved by the depth of their responses. I decided to ask myself the questions I’ve been asking friends: What’s one thing you do to bring beauty into your everyday life? What difference does it make? Why is that important? The truth is there are many ways that I bring beauty into my daily life and the more I think, talk and write about this topic, the more ways I discover. So let me start with the first thing that comes to mind: Every morning I drink tea from a handmade mug. Today I’ve using a light blue mug with a design of darker gray-blue and brown rectangles. It’s slightly oval-shaped, made from a slab of clay rather than thrown on a wheel. Does my tea taste better because I’m drinking from a handmade mug? Probably not in a scientific, objective, blind-taste-test kind of way. It does taste better in a subjective way because my experience is different. It’s kind of like getting dressed up to go out for dinner. The pan-seared halibut is the same whether I’m wearing jeans and a t-shirt or a linen tunic with slacks. But by putting on the linen tunic, I’ve turned this weeknight dinner into a special occasion and as a result the halibut is more delicious. Drinking tea is a very ordinary thing. The simple act of using a beautiful handmade mug renders it a special moment. As I hold the warm mug, I feel connected on many levels. This mug was a gift, and so it connects me with the person who gave it to me. All of my mugs connect me with the person who made the mug – whether or not I’ve met the potter. This in turn connects me with my own creativity. These connections affect my sense of self, especially since this is how I start my day. The ordinary is where we live – drinking tea, eating breakfast, cooking dinner, washing dishes, doing laundry. Bringing beauty into these everyday moments honors them. A hot cup of tea in a lovely mug first thing in the morning is a quiet beginning to a new day. I feel grounded and ready. 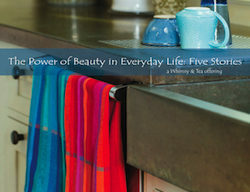 My invitation to you: What’s one thing you do to bring beauty into your everyday? What difference does it make? I’d love to hear. Do the things you use reflect your current self?